Every so often there comes along a book for which I find myself completely unprepared. One such book was In Search of the Miraculous which asked questions I could not answer and which still asks questions I cannot answer, and that was half a century ago. Another such book is The Reality of Being, subtitled “The Fourth Way of Gurdjieff,” based on notes and annotations of Jeanne de Salzmann. That book appeared only two years ago and it has already acquired something of a following. Its appearance too was unheralded. The present book is yet another surprise. It is called In Search of Being, the subtitle is “The Fourth Way to Consciousness,” and the author is given as G.I. Gurdjieff. Another book by Gurdjieff? (I recall with relish the clever cartoon that shows a hand-written notice posted on the signboard on the lawn of a parish church. Here are the words on that notice: “Important, If True.”) Later in this review I will look into the question of authenticity of this publication and its text. Right now I want to describe the volume that is resting on my desk, for it is an uncommonly handsome piece of bookmanship, as well as something of a surprise! During his lifetime Gurdjieff published one book called Herald of Coming Good (1933). Following his death in 1949, a stream of publications began to appear, beginning with the so-called “All and Everything” Trilogy which comprises Beelzebub’s Tales to His Grandson (1950), Meetings with Remarkable Men (1963), and Life is Real, Only Then, When “I Am” (1978). Independent of these are the texts of his talks that appeared as Views from the Real World (1973). That makes five books in all. Now there is a sixth – In Search of Being (2013). What a handsome book is the present volume! It measures six inches by nine inches and is attractively bound in cloth, embossed in gold, with a headband, with delicately coloured end-sheets, and with an attractive jacket that shows a watercolour of a landscape with a small figure in the foreground. The artwork is titled “The Road to Cold Mountain” and it is identified as the work of Natasha de Castro. The interior design and typography are impeccable, for the pages (xvi+269+i) are easy to read. Shambhala Publications, Inc., of Boston and New York City, has produced a fine specimen of the art and craft of the bookmaker. The fact that it is reasonably priced (at US $26.95) is presumably based on the anticipation of wide sales around the world. Over all, the current book has a “familiar” feel to it, so familiar in fact that I turned to my shelf of books devoted to the Work to take down my copy of Jeanne de Salzmann’s The Reality of Being which the same publisher issued three years ago. The designs and formats are the same. When I reviewed Madame’s book for this web-blog, I commented on the care that went into its production, right down to the jacket’s watercolour landscape with its tiny figure in the foreground. That watercolour is called “Inside the Milky Way” and the artist is identified only as “the author’s great-granddaughter.” I wonder if she could be Natasha de Castro. The two books are “of a piece,” so to speak, and if the landscapes depicted on the jackets are to be construed as evidence of this, the landscape of Madame’s book’s shows the dark sky at midnight, whereas the landscape of Gurdjieff’s book depicts the brightening sky at dawn. The title of the second painting invokes the enigmatic lines of the poem composed by Han-shan: ‘People ask for the road to Cold Mountain, but no road reaches Cold Mountain.” (The earlier book might be described as inner or “esoteric,” the later book as outer or “exoteric.”) In addition, the two jackets feature the sign of the Enneagram which is, or at least once was, unique to the Fourth Way. 1. Know Thyself. 2. Our Human Machine. 3. World within Worlds. 4. The Possibility of Evolution. 5. The Aim of Religion. 6. Seeking the Way. 7. A Practical Study. 8. A Work for Consciousness. 9. Toward Liberation. 10. Knowledge of Being. To give an idea of the contents of the short essays, here are the titles of the six essays that comprise the third section, “Worlds within Worlds”: Inside the Milky Way, The Law of Three Forces, The Ray of Creation, The Law of Octaves, Degrees of Materiality. Much information is concentrated in these essays and chapters, but given the brevity of the essays, there is little elbow-room for analysis or illustration. There is a sense in which each essay offers basic information for a talk or a lesson. I was unprepared for the surprising inclusion of the sixteen-page section titled “Biographical Notes” which, as the reader might guess, is concerned with the contributions to the history of the Work made by Gurdjieff, Ouspensky, and Salzmann. Indeed, by extension, this section covers a wider spectrum than that, for it peers back onto the role of the Seekers of Truth and looks around in a sketchy way to the present-day practices and concerns of the institutes, societies, and foundations. I found this section to be written with great care, with a style that restrains flair, recalling familiar formulations, but arguing for interpretations more in keeping with the long-term goals of the Work than with “taking sides” on personalities, directions, and other matters of passing interest. For these reasons, I am going to single out a dozen or so ideas that are stressed in these pages to reveal an informed mind at work. The teaching was introduced despite the civil war in Russia and the Great War in Europe. Different approaches if not different values were stressed in Moscow, St. Petersburg, Essentuki, Tiflis, Constantinople, and Western Europe. “It was at the Prieuré that Gurdjieff achieved widespread recognition, largely from public demonstrations of the Movements.” There is an adaptative quality to the Work: “In his later years Gurdjieff regarded the study of the original system of ideas as merely a preliminary stage of the work toward consciousness. He turned aside questions about ideas as being theoretical and brought his teaching in terms of a direct perception of reality.” So to the cities mentioned above must be added Paris and Fontainebleau/Avon as the centres of the Work in the form that it is practised these days. This observation, while not new, has become accepted. Those thoughts were inspired by sentences in the first section which is devoted to Gurdjieff. In the second section, devoted to Ouspensky, the author notes the hinge role of Boris Mouravieff “who knew both men” and who made the following observation: “One can say, without exaggeration, that without Ouspensky, Gurdjieff’s career in the West would probably have not gone beyond the stage of endless conversations in cafés.” Highlighted are Ouspensky’s romantic temperament and his distrust of science, or at least of academic scientists, as well as his interest in Theosophy and occult literature. Like Ukhtomsky before him, he was received at the headquarters of Blavatsky’s Theosophical Society at Adyar, today’s Chennai, Tamil Nadu, India. The bonds that bind Ouspensky and Gurdjieff, based on the goals that they had in common, are emphasized, even when Ouspensky decided in 1924 to “work alone.” This matter is discussed again and again. “There was no hostility between the two men. Ouspensky did not pretend to be on the same level of understanding, and spoke of his former teacher with great respect and affection. Most important, he had no quarrel with the teaching itself, no disagreement over interpreting the ideas.” Then an interesting suggestion is made: “It is therefore quite possible, even likely, that he approved of Ouspensky’s separation, and may even have suggested it himself.” It seems a rapprochement is taking place. In fact, this section alludes to the dramatic role of Judas Iscariot in Christ’s Passion, recalling references in the canon to the unbreakable bond between Betrayer and Redeemer. It surprises me that after all these years the dynamics of this relationship need to be re-examined, as I thought it obvious – or at least inevitable – there would be “a parting of the ways,” a parting that was not really what it seemed to be. The third and final section is devoted to Jeanne de Salzmann to whom the Fourth Way “is a path to be followed, a practical way to consciousness of reality in onself.” The text continues, “She was among the handful of his pupils included in what he called ‘special work’ for a direct perception of reality through conscious sensation.” Before he died, Gurdjieff instructed her to do “everything possible – even impossible – in order that what I brought will have an action.” (Here I might add that the “school” became not a really a “high school” but something of a “dancing school.”) “The speed with which she organized Gurdjieff centers within two years of his death suggests a predetermined plan.” This view of Madame I find to be sympathetic and suggestive of the self-altering nature of what long, long ago was known as the Special Doctrine, as distinct presumably from the theosophical Secret Doctrine. I have devoted some attention to “Biographical Notes” because this section is carefully and concisely written and the points are well argued, albeit in brief compass, but they will grant the reader, whether newcomer or veteran, an enriched if not a refreshed perspective on the Work, and this surely is the point of the book as a whole. I understand that Mr. Grant and his wife Anne-Marie Grant are stalwarts of the New York Foundation and that they (singly or together) are the presences behind not only the present publication, In Search of Being, but also the previous one, The Reality of Being. A medieval Italian phrase might describe their efforts, and that phrase is “a fine Italian hand.” The phrase implies a combination of two qualities in writing and handwriting, craft and craftiness, and refers to anything so written as to establish a standard for fine workmanship. “This science viewed the world of visible matter as modern physics does, recognizing the equivalence of mass and energy, the subjective illusion of time, the general theory of relativity. But its inquiry did not stop there, accepting as real only phenomena that could be measured and proven by controlled experiment.” I am uncertain about the reference to “controlled experiment,” but that sentence certainly distances the teaching from Theosophy by emphasizing the teaching’s compatibility with the theory of relativity and quantum mechanics rather than the revival and renewal of ancient occult traditions. The editor then explains that the present publication is largely based on the St. Petersburg lectures delivered by Gurdjieff to Ouspensky’s pupils as recorded by Ouspensky. “The present book is intended to fulfill the original purpose for the St. Petersburg talks. It restates Gurdjieff’s quoted exposition, supplemented by his later lectures, mostly in 1922-1924.” The editor compares the work here to that later undertaken by Madame de Salzmann. “These subsequent talks, which took place at the Prieuré in Fontainebleau and in New York, were recorded and arranged by Jeanne de Salzmann, Gurdjieff’s closest follower. They were published in 1973 under the title Views from the Real World.” It occurs to me that one of the casualties of the Revolution and the War is what might be termed “the Gurdjieff-Ouspensky collaboration”; it was certainly disrupted, so the planned book never appeared. Instead, in general, close to one century later, that book has finally appeared, in the guise of the collaboration of Gurdjieff-Ouspensky-Grant. Grant did not work alone. “This book was arranged and edited with a small group of followers of Gurdjieff and of Mme. de Salzmann. Apart from this foreword and the biographical notes, the text consists almost entirely of Gurdjieff’s own words, restated from the new English translation of the original Russian text of Fragments of an Unknown Teaching and … from Views from the Real World.” The editor adds that the subsection “Functions and Centers” is derived from Ouspensky’s Psychology of Man’s Possible Evolution. This seems straight-forward enough but it would be the devil’s own job to track down the texts that are excerpted and glossed. Still, care has been taken; respect has been shown. “Gurdjieff’s spoken words, delivered at different times and on different occasions, have been modified, mostly in style and voice, where necessary for a consistent presentation in a single book.” Here it occurs to me that this undertaking is not more radical than the revision (which was authorized by Madame) of the classic first edition of Beelzebub’s Tales. This is in keeping with Grant’s conviction that the Fourth Way is “a way of understanding” and that “nothing should be taken literally,” as man’s needs evolve and devolve with the decades. The Foreword continues with a distinction between “the outer, exoteric form of the teaching that is visible to the uninitiated and the inner, esoteric content that can be known only by adherents who practice it.” The unusual suggestion is then made that because the group at St. Petersburg was “an unprepared audience,” the teaching was exoteric in form. Little of it had to do with its esoteric dimension or nature, “the practical inner work required either for relating the lower centers or for opening to the higher centers,” references to which are cloaked in Beelzebub’s Tales. I have been beating around the beating heart of this book, the forty-seven subsections or excerpts or extracts, keeping them for the end. Not quite the end, as I believe at this point that an excursus is in order. The act of thinking about the composition or recomposition of In Search of Being brought to mind similar undertakings, though none is sufficiently close as to permit a sustained comparison. It has long been forgotten that W. Somerset Maugham devoted considerable time in the late 1940s to reading the “Ten Greatest Novels of the World” (War and Peace, etc.) and then condensing the texts. In his shortened versions of the classics, the words are those of the authors but their elaborations have been trimmed to the bone. I have read two of these novels and I found them to be somewhat satisfying, though Maugham himself expressed dissatisfaction with the response of critics and readers, especially in terms of sales and royalties. No one loves War and Peace after reading it in Maugham’s version. Less relevant are Reader’s Digest Condensed Books (issued between 1950 and 1997) which offered readers “abridged” or “condensed” books (mainly novels) to allow them a sense of the story.Today they read like Harlequin Romances. Somewhat more relevant is the experience of Professor Kevin O’Brien who in Oscar Wilde: An Apostle for the Arts published the texts of the three addresses that Wilde delivered during his lecture tour of Central and Eastern Canada in1882. The manuscripts of two of these addresses have survived the vicissitudes of the years, but the manuscript of the third address has been lost to posterity. Yet because Wilde delivered the third address so many times, and the journalists of the day, many of whom practised shorthand, were required to report on it in considerable detail, generally verbatim, Professor O’Brien was able to “reconstruct” from their published reports the text and offer it as the lost lecture, now found. Indeed, it reads like an “original” address by Wilde. This is an undertaking of reconstituting a lost work that is familiar to the editors of classical texts. Scholars of Ancient Greek, faced with the patchwork survival of parts of, say, Sappho’s poems, have made educated guesses as to what the Greek poetess meant to say. I introduce these matters to suggest there is a wider context for the manipulation of extant texts here than is generally recognized. Perhaps a distinction is in order, one that was popular with Roman Catholics in the pre-Vatican II era, when priests and sisters made the distinction between two levels of sin and sinning. There are “mortal sins” – perish the thought! These are weighty and serious matters, crimes really, for both sinner and society. Then there are “venial sins,” transgressions that are less serious in nature which are readily forgivable and quite understandable, rather like infractions. (One might think in terms of drunk driving charges versus parking tickets.) The adjective “venial” is often confused with the adjective “venal.” Venial sins are quite human in nature, often committed with the best of intentions and irritating consequences; venal sins are mortal sins, pure and simple, and serious indeed. It may seem farfetched to introduce this terminology in this review, except that in my own mind I find what has been done here in the construction of this book and in the attribution of it to Gurdjieff alone is, if a sin at all, one that is “venial” rather than “venal,” an infraction or infringement, the bending of the expectation of the reader rather than the breaking of a bond with the reader. It is understandable and forgivable, and presumably the end in mind justifies the means employed. I expect there are readers who are involved in the Work who will find the use of the byline misleading and inexcusable. I am not one of them. End of excursus. I have already devoted 3,500 words to this review of In Search for Being, so I am reluctant to add many more, though I would have to do that were I to include a detailed analysis of each of the ten chapters with their forty-seven subsections of text. There is little point in doing so here, as the reader is presumably familiar with the outlines of the teaching – as the result of active participation in the work or as the result of close readings of the canon. It is unlikely that he or she will find here any new information – in the sense of unfamiliar images, analogies, comparisons, symbols, stories, fables, insights, techniques, practices, or expressions – but instead the reader will find now-familiar conceptions expressed with singular ease in these edited selections and passages. Hence the book is an ideal one to use to introduce the Fourth Way to newcomers. Because of the byline, old-comers will want to add it to their private libraries. Yet I will not conclude this review sounding that note! I anticipate seeing a selection of the subsections of this book printed in the pages of Parabola and other journals now and in the future. The overall impression that I have as I read these pages is that I am listening to a congenial Gurdjieff delivering lectures in fluent English, making his teaching accessible and agreeable in terms of the mentality of the day – our day. That is certainly part of the man, but it is certainly not the whole man. Reaching the last page and closing the book, I have to ask myself the question that the reader will undoubtedly ask himself or herself. That question is the following one: “Is this a new book written by G.I. Gurdjieff?” It is a question worth pondering. Here is my answer: “No, it is not a new book written by Gurdjieff. Instead, it is something of “an old book” that could be signed by Gurdjieff. Nothing in it is “new” except for the arrangement of the passages. The word “written” does not apply, either. Gurdjieff himself wrote little – most of what he has had to say in print was dictated to secretaries, translated by assistants, reported by Ouspensky, rewritten by A.R. Orage, recalled by followers, etc. The adjective “old” refers to the fact that this material is “old and familiar,” not “brand-new,” though it has been polished and smoothed, selected and adapted, repackaged and recycled. The appearance on the title page of the unmodified byline “G.I. Gurdjieff” may be seen to be misleading in terms of authorship, but it may also be held to be defensible in terms of offering the message of the man, which has been reflected and refracted for use in this medium of expression. It has been done well. To the degree that it deserves to be done at all today, let me add that I could not imagine how it could be done better. 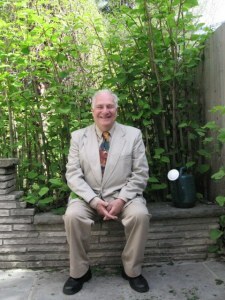 John Robert Colombo is a Toronto-based author and anthologist who writes regularly for this website. Most recently he contributed the Foreword to Paul Beekman Taylor’s Real Worlds of G.I. Gurdjieff. To appear this Spring is a collection of his poems titled A Standing Wave, to be followed in the Fall by an omnibus edition of the texts of the seven novels that Jules Verne set in Canada. His website is < http://www.colombo.ca > . If you wish to receive notice of his forthcoming reviews and commentaries in this webblog, drop JRC a line at < jrc@colombo.ca > . This entry was posted in JOHN ROBERT COLOMBO reviews IN SEARCH OF BEING, REVIEWS and tagged A Practical Study, A Work for Consciousness, In Search of Being, Jeanne de Salzmann. Jeanne de Salzmann. Natasha de Castro, Know Thyself, Knowledge of Being, Our Human Machine, Seeking the Way, The Aim of Religion, The Fourth Way to Consciousness, The Possibility of Evolution, Toward Liberation, World within Worlds on January 20, 2013 by SOPHIA WELLBELOVED.